Do you know a deserving family or non-profit that could use free painting services? Often, as we near the Thanksgiving holiday, we start writing gratitude lists and doing daily Facebook posts. We try to focus on being grateful for more than just one day, so we highlight something different each day. We highlight little things like a friendly grocery store clerk and bigger things like a clean bill of health, a loving spouse, or a helpful child. Our favorite boo-tique selections will make this holiday especially spooky! Your child grows fast - here's how to enjoy every phase. ATA Martial Arts students take home the gold at World Championships. An SCVi junior shares what kids really think about "back to school." Get fit as a family with real lifestyle modifications that make a difference! Smart tips to get your child to eat better - and lots more. After four years of writing nothing but research papers and the occasional Yelp review, I apologize if my writing skills are a little less polished than they use to be. When I first began writing for Inside SCV, I took my reviews very seriously. Yes, I wanted to be clever and entertaining, but I really thought that my opinion on what novel should be read next or restaurant should be visited after soccer practice was going to change lives! You won't want your young child to miss out on Safety Town - a weeklong summer camp you'll love! Don't miss the new Farmers Market and ESCAPE's next production - "The Sound of Music!" Did your dad teach you how to ride a bike? How to make a killer omelet? In honor of Father's Day on Sunday, June 21, we asked our readers about the lessons their dads shared with them. Want to join the conversation - and have a chance to win great prizes all month long? 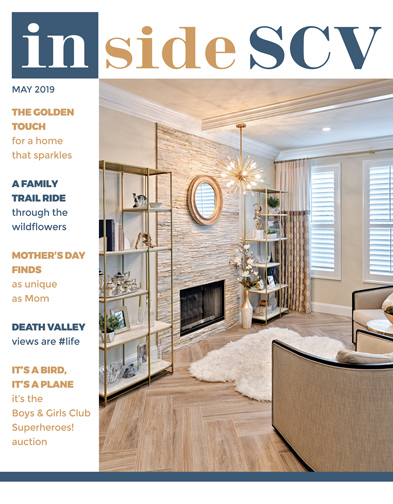 "Like" Inside SCV Magazine on Facebook at www.facebook.com/insidescvmagazine. Summer camp means a hundred things to a kid - making new friends, letting go of everyday worries, learning new things, and going to bed each night bone tired with the day's new experiences fresh in your mind. Whether you're at a day camp or an "away" camp, the experience is packed full of incredible opportunities to broaden one's horizons and explore a new environment. We wanted to know: What makes your mom special? Your answers made us smile - and cry! Want to join the conversation? "Like" Inside SCV Magazine on Facebook! Everything Mom wants for Mother's Day is right here! Fun for them and convenient for you, SCV's best summer camps are open for business! Book your child's hot-weather to-do now, as space fills early. You won't want to miss this "Alice" inspired tea party! Did you know that kids as young as 3 can learn tennis? If you resolved to do more for your family in 2015, this is the story for you!